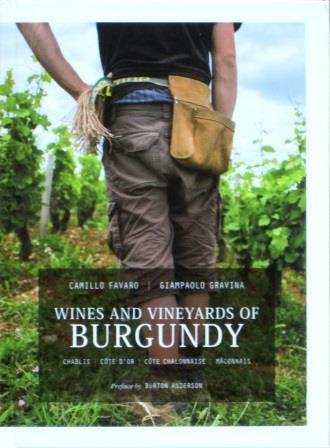 The recent publication of Wines and Vineyards of Burgundy (ArteVino, 2018) achieves a new high in the internationalization of wine, as well as being a serious accomplishment in wine criticism: It’s a fine English translation of a truly interesting Italian book about some wonderful French wine. This attractive, informative volume by Camillo Favaro and Giampaolo Gravina was translated and edited by Burton Anderson in collaboration with Joanie Bonfiglio. Anderson also contributed a preface. The book has handsome photos by Maurizio Gjivovich, as well as a suite of clear and useful maps. Italians have a different take on French wine than most Anglophone winos, a fact that made this book very interesting to me as a cultural or cross-cultural document. An inferiority complex about French wines used to color almost all my conversations with Italians about foreign wines, leading to the most preposterous overcompensations – for example, a young winemaker in Venezia-Giulia, many years ago, who had never travelled farther than Venice but who solemnly assured me that his indifferent white wine was as good as Chablis, which he had never tasted. Fortunately, such episodes are now a thing of the rapidly receding past, and Italian winemakers these days are a lot more sophisticated. Most are much travelled, not just to their markets but also to their international colleagues and competitors. For many, that means what amounts to a pilgrimage to Burgundy, with which they often feel a deep affinity. 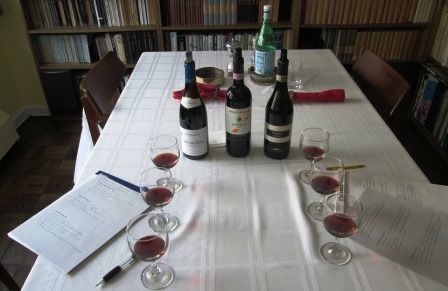 Most Italians even remotely professionally connected with wine – especially Piedmontese – are thinking about Burgundy when they talk about French wine. (The big exception to that gross generalization is Tuscany, where the ties to Bordeaux hold strong.) 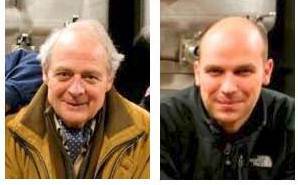 Favaro and Gravina are typical in their passion for Burgundy, though far above average in the extent of their enthusiasm and their qualifications for writing about it. Camillo Favaro (left, above) runs both his family winery in the Piedmont and ArteVinoStudio, an agency devoted to creative communication and design work for wineries. Giampaolo Gravina (right) is a professor of philosophy who has also had a long career as a wine journalist, most notably as one of the editors of L’Espresso’s annual Vini d’Italia. Both have written books on wine, separately and in collaboration: This present work is an expansion and updating of their earlier Vini e Terre di Borgogna. They are similarly well informed about all the domaines they feature. I was impressed, for instance, with their discussion of the soil differences and consequent differing styles of Chambolle-Musigny, a wine that is one of my favorites and a Burgundy area I thought I knew well: I learned some new things in reading through this section – as I did also in reading about Nuits-Saint-Georges, another of my favorites. I think that Favaro and Gravina are spot-on in their characterization of the producers they discuss: The better I know the wines in question, the more I agree with. For instance, their description of Henri Gouges’s 2015s: “despite their typical internal density, our tastings have brought to light a general fusion of fleshiness with surprisingly accessible, delicious juice.” Absolutely right, for my palate. Nonchalance may be a bit over the top, but by and large I wish I’d said that. 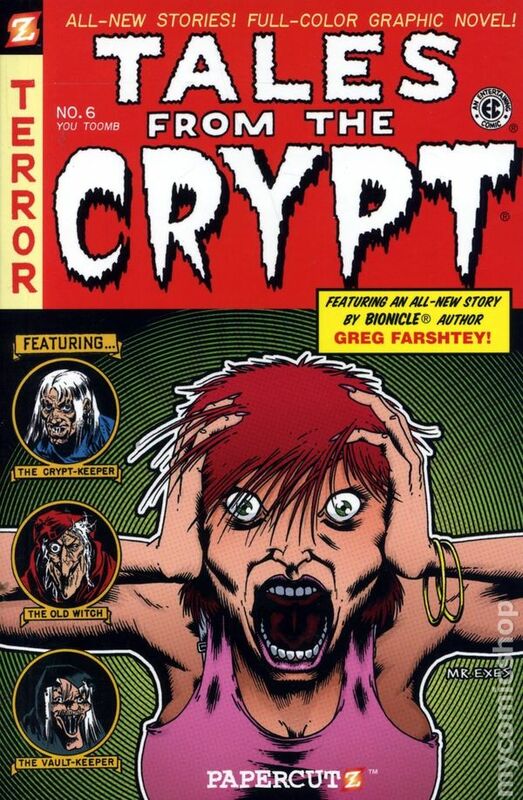 The writing throughout is of that high level, beautifully conveyed by the translators. Wines and Vineyards of Burgundy was for me a very enjoyable, very informative, and very personal excursion to Burgundy, and I think it will be so for any lover of Burgundy’s wines. Around the holidays, and especially if friends are joining us for dinner, Diane sometimes elaborates our usually delicious, mostly Italianate dinners by undertaking a few complex French dishes, and I try to select wines to play up to them. This year – this past year, I must now remember to say – consciousness of the passing of time pushed me to open a battery of French beauties, the youngest a 14-year-old Burgundy and the most venerable a 52-year-old Bordeaux. They were gorgeous, every one of them, and coordinated beautifully with the food. They were also a nostalgia trip, reminders of the kinds of flavors that got us hooked on wines in the first place, way back when newly minted assistant professors could afford serious Bordeaux and Burgundy. Where are the snows of yesteryear indeed? Those days are gone forever, and so I fear are the kind of refined, restrained wines that were then the French norm. That incredibly elegant 1966 red Bordeaux was still live and lithe, though it had just 12 degrees of alcohol. We shall not see its like again. 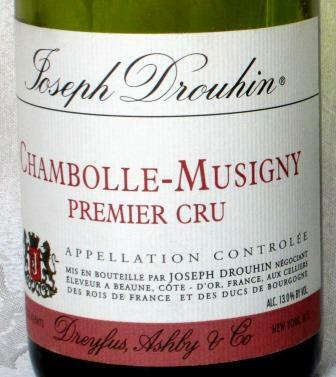 For our Christmas Eve dinner à deux, I opened this Drouhin Chambolle Musigny. Drouhin is my favorite Burgundy négociant, a house of the highest standards and impeccable reputation, for some years now committed to biodynamic production. 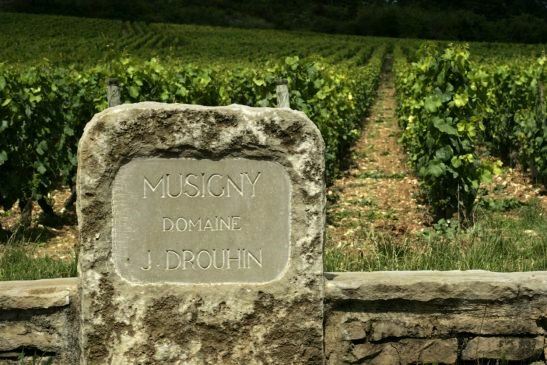 Musigny for me is the quintessence of Burgundy, the small, sweet spot where all the magic of the Côte d’Or concentrates. If I could begin to afford it, I would drink its wines often; as my finances stand, they are rare special occasion wines. This one did not let me down. 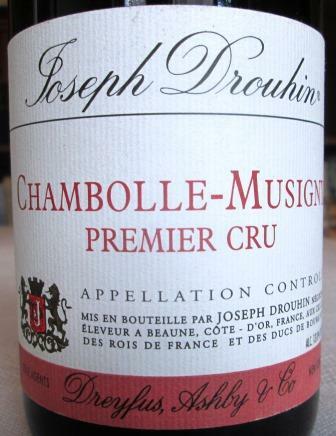 This wine originates in several tiny parcels of Premier Cru vineyards that Drouhin owns, harvests, and vinifies together. (Tiny parcels, often only a few rows of vines, are quite common in Burgundy, where a hillside site may be divided among many owners.) After fermentation, the wine spent between 14 and 18 months in barrels. Of those, only 20% were new oak, so the Musigny Pinot noir’s rich cherry and earth flavors, and its scents of game and truffle, all showed through unmasked by any woodiness. The wine’s velvetiness results from the interplay of the grapes and wood, and shows all the customary elegance of the Drouhin style. In the Côte d’Or, 2004 is remembered as the vintage of the marvelous September, whose sunshine and warmth transformed what had been shaping up as an iffy harvest into a splendid one. This wine showed just how splendid: its poise and grace and vitality promised years of life yet to come. A simply wonderful wine. Then came Christmas day, with good friends Charles and Michele joining us for dinner. To accompany a salade de confit de geziers, a roast duck, and a cheese platter, we progressed through three red Bordeaux: Les Ormes de Pez 2000, Pichon Baron de Longueville 1978, and Gruaud Larose 1966. They all seemed to make each other better, each solo helping to form a lovely concert. 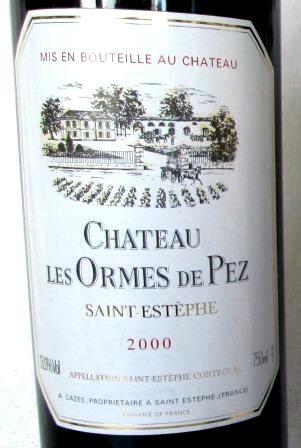 Les Ormes de Pez is an old family favorite, one of the first Medoc wines that Diane and I ever drank together, and one we’ve loved ever since. A humble Cru Bourgeois St. Estèphe, it has always seemed to us superior to its ranking, with a distinctive taste of its commune’s gravelly soil and dark fruit, paradoxically light on the palate. 2000 was a brilliant vintage for all the Bordeaux appellations, and this bottle was a fine example of it, supple and live and graceful. These days, when so many of the grands crus have grown big, heavy, and powerful, I think more and more that the so-called “lesser wines” are now the champions of what was once the universal Bordeaux style. 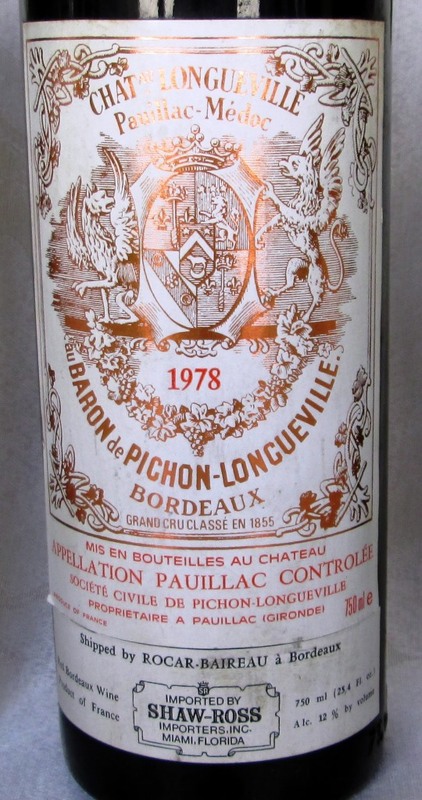 Our second red had nothing humble about: Pichon Baron was ranked a second growth in the original 1855 classification, and it has maintained that place in quality and esteem. It’s a big estate, with over 70 hectares in vines, of which Cabernet sauvignon is about two-thirds, Merlot most of the balance, with tiny amounts of Cabernet franc and Petit verdot – the classic Bordeaux blend. It’s a Pauillac and so now usually counted among Bordeaux’s heavy hitters, though – perhaps because it lies so close to the vineyards of St. Julien – I’ve always found it inclining more toward elegance and restraint than toward big fruit and power. Certainly this 1978 fit that description, its mature fruit showing beautifully in a wonderful balance of acid and alcohol and soft tannins. Some vintage charts I’ve looked at would have it that the ’78 Bordeaux are over the hill, but my – admittedly limited – experience of them shows rather that like this wine they are just now really coming into stride, with years before them yet. Our third wine, a Gruaud Larose, really brought back past times for Diane and me. The wine is one that has figured importantly over the years at wonderful dinners with some of our oldest friends, and this specimen is – was – my oldest bottle of it. 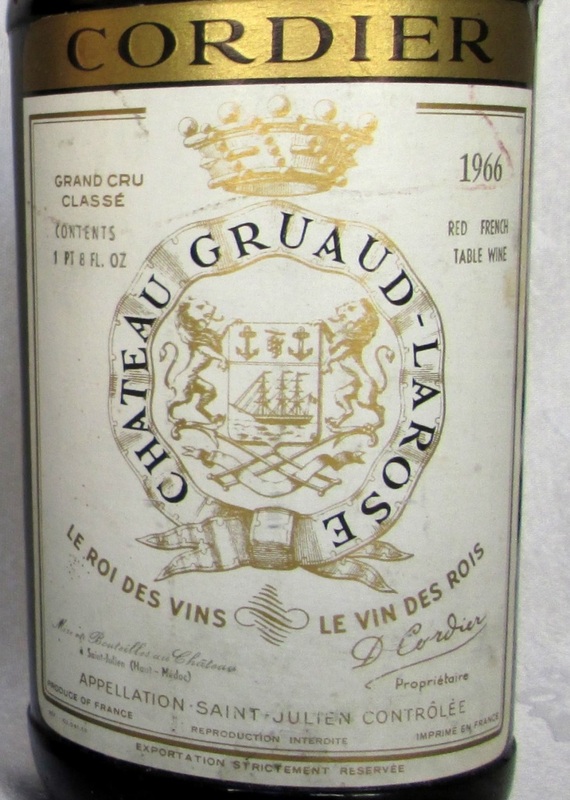 In addition, 1966 was a wonderful vintage, genuinely one of the vintages of the century, before Bordeaux learned the retail value of declaring them so every two or three years. Classified a second growth St. Julien in 1855, Gruaud Larose has passed through many owners since then but still occupies almost the identical territory it had in 1855. A large estate of almost 85 hectares in vines, it’s planted roughly 60% in Cabernet sauvignon, 30% in Merlot, and the remaining 10% divided among Cabernet franc, Petit verdot, and Malbec. Oddly, to my mind, Gruaud Larose has a reputation for inconsistency. That has not been my experience of it: I’ve never had a less than fine bottle, and some, like this lovely 1966, have been just plain wonderful. Maybe I’m just lucky, but this ’66 had all the elegance that St. Julien is noted for, and all the charm and warmth and life that that great vintage showed right from the start. It was probably at its peak, but it showed no sign of faltering, unless you count a substantial layer of sediment as a sign of impending doom. (I don’t.) A great wine, and it sealed a great meal with old friends – which is exactly where a great old wine belongs. My wine “cellar” is in fact a rented mini-storage unit in a big, thick-walled warehouse alongside the Hudson River, not too cold in winter and not too hot in summer. Most collectors would scream with horror at such an uncontrolled repository for their wines, but I’m not a collector and never have been. The wines I’ve stored over the years have been a hodge-podge: some bottles I wanted to give more maturity before drinking, and some samples – from back in the days when I was a more active wine journalist and samples came in over the transom – that I didn’t have time to taste at the moment but thought I might need for future articles. So if less-than-perfect storage conditions meant speeding up their maturation – in effect adding a few years to their calendrical age – that was and is no problem for me. In fact, it’s an advantage, since I have no plans to bequeath a cellar to my heirs and assigns, and I’d like to taste these wines while I still have functioning taste buds. This is a long preamble to the fact that, now that I’m plodding my way through the Vale of Years, I’ve stopped adding wines to my hoard and started bringing home cases for tasting and drinking. Most of the time, these cases form a pretty mixed lot: My most recent one consisted mostly of 2007 and 2008 wines – some Burgundies and Chateauneufs and some Tuscan and Piedmontese bottles – all red, and all potentially pretty nice drinking, even if still a bit young by strict standards. But this also furnished an opportunity to test just how quickly my less-than-perfect storage was aging these wines: Would I be able to taste properly maturing flavors, and would they be appropriate ones for 10- or 11-year-old wines? Interesting questions, and just the kind to tempt an old wine-bibber to make a test. 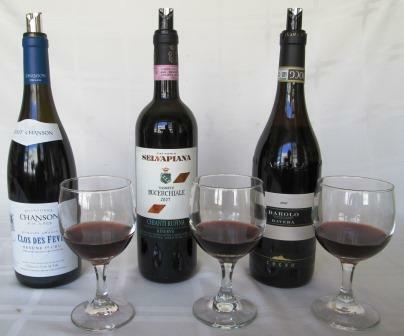 So test I did, choosing 3 wines of the 2007 vintage from the case, a Chanson Clos des Fèves Beaune Premier Cru, a Selvapiana Bucerchiale, and a Cogno Barolo Ravera. I opted for those three wines because I know them well and am familiar with the pattern of their development. And I picked 2007 because it was a good, solid vintage in all three zones and because, at 10-11 years old, these wines ought to be on the cusp, passing from youth to maturity. So for my test purposes, these wines would be perfect subjects, able to answer the questions I’m asking. I allowed all the wines three hours breathing in bottle, not decanted. First wine up was the Chanson Clos des Fèves, which showed clear garnet with a definite orange edge – in a French wine, a definite sign of aging. It had a good nose of dark berries and dried fruit, with underbrush notes and a slight hint of wood. On the palate, the taste confirmed the aroma: dried cherry, medium body, fine balance, graceful and elegant, with a long, dry, fruit-and-leather finish. A little less substantial than I would have hoped, and a little further along its evolutionary path than I expected, but still not fully mature. In an ideal cellar, I would expect this wine to peak at about 20 years old or a little bit more. This bottle I would think would have needed only two or three more years to develop fully: to put on a little more flesh and open more forceful mature aromas. Next came the Selvapiana Bucerchiale, a slightly darker wine with a bit more orange at the edge, which is quite characteristic of many Italian wines and not necessarily a sign of aging. It had a biggish aroma of dried fruits – a suggestion of prune – and earth notes. In the mouth, it was big and soft, with dark flavors – dried berries and a little tobacco – with fine balance and persistence. Not a huge wine, but mouth-filling. Though it showed no fresh fruit tastes, it still seemed some years from full maturity. I’d say that it’s on a proper path of maturing though a bit accelerated: From what I know of Bucerchiale, I would expect it to peak at about 25 years old in an ideal cellar; in mine, I think it will top off at about 20, which can’t come soon enough for me. Then I tasted the Cogno Barolo Ravera, which showed the most orange of all the wines, and which I regard as perfectly normal for developing Nebbiolo-based wine. 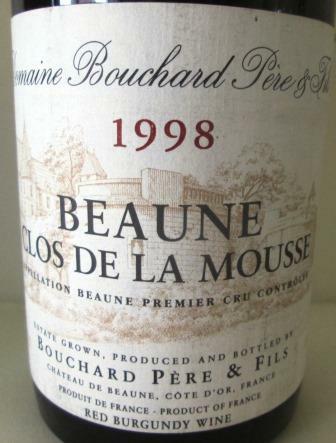 The nose offered a whole mélange of elements – dried cherry/berry, wet stones, mushroom, with similar notes in the mouth, where it showed as big and slightly tannic. On the palate this wine displayed no fresh fruit, but not all the mature Nebbiolo flavors that I look for were yet in place. So it is still evolving, and still needs some years before it will be fully mature. In a good cellar, this wine will go for 30 or 40 years: good Nebbiolo wines do that. In my storage, I expect it to be drinking best at 20 to 25 years old – which is a lot better for those of us not building heritage collections, but for a person of my age is still seriously pushing the envelope. This for me was a really interesting experiment, and it confirmed a lot of what I’ve thought about “cellaring” wines – principally that a lot of what have been thought to be absolutes about how wine is to be stored are far from absolute. Rather, they’re based ultimately on the evolution of wines in their makers’ caves or in the cellars of 19th century English great houses, cellars that are meant to be steadily drawn on and augmented over a lifetime and left as an inheritance for one’s heirs. That doesn’t speak to the needs of people of more limited means and lacking anything approaching a great house, who want mature wine to enjoy in their lifetime. So as regards the “rules” of wine storage, I’d borrow a phrase from Martin Luther: Sin bravely. Just think about what you want from your wine and how to get it, then go and do it. Not all the quality wine houses in Burgundy are centuries-old firms: There are a few relative newbies who have made it into the upper echelon. One such – one impressive such – is the family firm Domaine Antonin Guyon, a good portion of whose lineup of wines I had the pleasure of tasting just a few weeks ago. Guyon is a 50-year-old firm, which by Burgundian standards makes it the new kid on the block. As I’ve been growing older (wiser and more knowledgeable, I’d like to say, but let honesty prevail: older), my youthful passion for Burgundy has been steadily reviving, and I’ve found myself playing catch-up with all that has happened in that appellation while my attention has been elsewhere. Much indeed has happened there: Perhaps most significantly for wine lovers, global warming has been doing wonders for Burgundy’s ripeness at harvests. While by no means yet an earthly paradise of reliable sunshine and moderate precipitation, Burgundy in recent years has been celebrating more good harvests than had ever been the norm before. Other changes too have occurred: More small growers now bottle their own wine than ever before, and more small, relatively specialized (in subzones, or organic wines, or other esoteric criteria), high-quality négociants have found a niche in Burgundy’s business landscape. And a few newcomers have even been able to break into the winemakers’ winners circle by patiently and carefully acquiring small parcels of land, one at a time, to eventually assemble a sizable domaine of top-quality sites. Domaine Antonin Guyon is a perfect example of this. 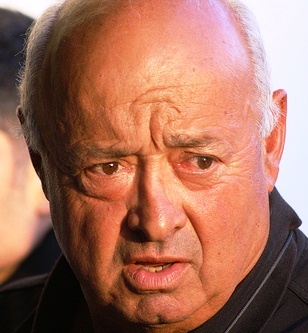 Founded in the 1960s by the eponymous Antonin (who was himself, in his mid-fifties, a wine newcomer), with vineyards in two of the prestigious Côte d’Or appellations, Meursault and Gevrey, the estate grew substantially in the 1970s with his son Dominique’s small-piece-by-small-piece acquisition of what amounted to a substantial stretch of vineyards in the Hautes Côtes de Nuit. Continuation of that policy has brought Domaine Guyon to its present extent: 47 hectares of vineyards in 27 Burgundy appellations. The caliber of those vineyard sites will be apparent in the list of wines presented at the tasting I enjoyed. A very nice basic Burgundy, typical and pleasing. An excellent entry-level wine. Lovely wines. The 2012 is approaching readiness – nicely aromatic, soft and round in the mouth, tasting of white fruits and wet stones. The ’13 is similar to that, but appropriately younger and not fully formed, while the ’14 is an infant, discernably like the other two but still developing and even a bit closed. Big wines, but even the 2011 is still somewhat mute and unready, though it does show a good strong finish, which promises very well for its maturation. The ’14 is very young, pleasing but still unformed. I’ve always been fond of Puligny-Montrachet, and these two did not disappoint me. The ’13 was fine, with a firm body and mineral-laced pear and apple flavors, finishing long. The ’12 showed even stronger: In fact, it was my favorite white of the tasting – big and elegant and very long-finishing. In theory, these were the biggest, most structured whites of the tasting. They probably are, but as such they also need the most time to develop. The ’11 was just opening and giving hints of greatness, while the ’12 was almost totally closed. On the basis of what Guyon is accomplishing with “lesser” crus, I would trust these wines to develop beautifully, but they will need time. The 2012 was quite typical of the zone – a little rustic, very soft and drinkable. The ’13 showed higher acid than the ’12, and tasted richer and more lively – a very nice wine indeed for simple dinners. Regular readers of this blog will know my fondness and respect for the wines of Musigny. I enjoyed this example very much: Rich and soft, it was already starting to develop some complexity and elegance. Quite good, I’d call it. A very different wine from the preceding Chambolle. Slightly sharper and more angular, more acidic and more assertive. It needs time to round out and compose itself. Terroir triumphed over vintage variation in these two wines – their similarities are remarkably strong. Although still young, both are developing nicely, already round and composed and very enjoyable. A lovely wine, with typical Corton heft, and already complex. It needs time to pull together further, but it will be very fine. A thoroughly admirable wine, already almost fully in balance. Big, smooth, and deep – in short, very fine indeed. Not as big as the preceding Corton, but strikingly elegant. In five years, this will be a memorable wine. Quite recently, and for no special reasons beyond a nowadays almost constant nostalgia and a lovely looking piece of beef scheduled for our dinner, I opened for just the two of us a bottle of 2002 Nuits-Saint-Georges Premier Cru Les Boudots. This is a wine that has a long history with us, almost as long as our marriage. Way back at the end of the Sixties, we decided we wanted to really get to know wine. We had been enjoying it for some time, but haphazardly: now, we felt, it was time to learn it systematically. We were both academics, so what would you expect? There were, in those days, very few wine books and even fewer wine courses, and of course no online resources because there was no line to be on. So during one of our then fairly frequent visits to Baltimore, we went to Harry’s, a wine shop that I knew had been patronized by the most esteemed of my graduate-school mentors, and we asked the proprietor to put together a mixed case that would allow us to familiarize ourselves with a range of wines. He asked us only how much we wanted to spend. I’m pretty sure we said a hundred dollars, gulping at the enormous expense. Harry then put together for us a dozen wines that Diane and I drank with dinners over the next few weeks, paying as much attention as we could to what was going on in our mouths. That was one of the most pleasurable educational experiences of a life that has been blessed with many wonderful educational experiences of all sorts. It not only taught us a great deal about wine and its many guises, it also provided us with a battery of what became life-long favorites – one of which was Nuits-Saint-Georges Les Boudots. That first bottle, as I recall, was a 1964 vintage from the (I later learned) important Burgundy producer Henri Gouges. My most recent one was from Jadot, a name familiar to most wine lovers. There have been many other Nuits-Saint-Georges between those two, not all Les Boudots, not all Premier Cru, indeed not even all cru, but our fondness for the commune’s combination of earthiness and grace, rusticity and elegance, has never wavered. Perhaps the only thing that has changed is our growing preference for older wines: I don’t think we would now drink a Nuits as young as that ’64 then was, if we had any choice at all. I’ve also learned since then a great deal more about the wine that so impressed us. Just like almost everything else connected with wine, what I learned involved a little geography, a little history, and a lot of nomenclature: grape names, place names, wine names (sometimes the same as one of those first two, sometimes not), yet more specific place names, producers’ names, negociants’ names, and names of a lot of practices and procedures in the vineyards and the cellar. I take a lot of that for granted now, but it was initially very humbling to realize just how many elements and how many people contributed to the making of that glass of wine I was so casually swirling, sniffing, and savoring – and it’s a very healthy exercise to remind myself of all their efforts now. So: Nuits-Saint-Georges. The wine takes its name from a small town/large village about halfway between Dijon and Beaune, in northeastern France, not too far from the Swiss border. The town lies at the very southern terminus of the Côte de Nuits, to which it also lends its name. That piece of earth is the northern half of the fabled – in wine lore at least – Côte d’Or, a stretch of vineyards that in its entirety runs from just south of Dijon down past Beaune (for which its southern half is named) to Santenay – about 30 miles or so of vineyards, never more than a few miles wide. Collectively, this is the domain of Pinot noir and Chardonnay, and the wines vinified from those two varieties in the various townships of the Côtes are some of the most prized and sought after in the whole world of wine geekery: Gevrey Chambertin, Morey Saint Denis, Chambolle Musigny, Vougeot, Échezeaux, Vosne-Romanée, Nuits-Saint-Georges – and so on, through Beaune and Pommard and Volnay right down to all the Montrachets. 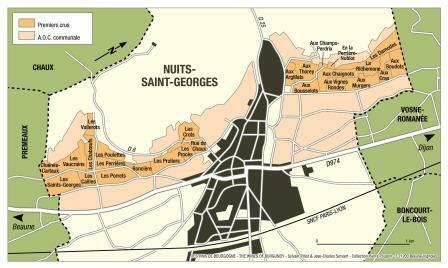 Nuits-Saint-Georges has been famous for its wines for centuries – just how many is hard to determine. Not far to its east lies the Cistercian abbey of Citeaux, a site from which, in the high Middle Ages, knowledge of viticulture and viniculture spread out to the rest of Europe – so for at least that long. 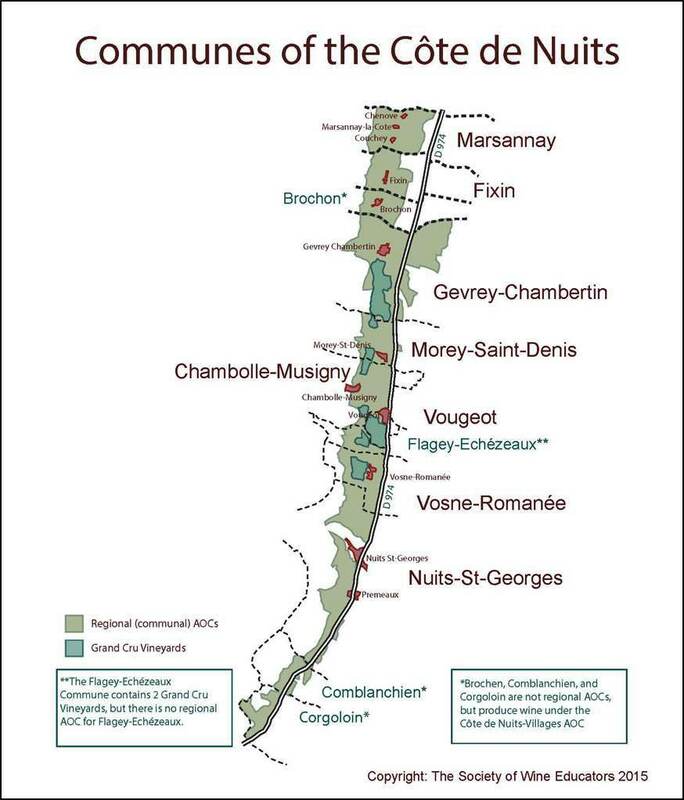 In the modern ranking of Burgundy crus, Nuits-Saint-Georges was awarded 38 Premiers Crus – more than any other Burgundy commune – but no Grands Crus. Some Burgundy experts – of which I am certainly not one – say this was a sound judgment, others say that it was primarily due to the modesty of Henri Gouges, at the time the region’s most important personality and a member of the commission determining those rankings. Be that as it may, Les Boudots – sometimes Aux Boudots – has always been esteemed among the most significant sites of the appellation. The Boudots vines grow in the northernmost piece of Nuits-Saint-Georges, right up against Vosne-Romanée, of whose terroir Boudots’ slopes are a continuation. That creates one of the first nomenclatorial problems the aspiring Burgundy-bibber encounters: According to the Burgundy experts, Boudots’ wines are the least typical of Nuits-Saint-Georges – not earthy enough, not rustic enough, and so on – and this, apparently, is not good. I just don’t get that. What difference does that name make? Just because Boudots lies in the Nuits-Saint-Georges appellation, do the qualities that make a fine Vosne-Romanée make a bad Nuits? This doesn’t make sense. In my experience of Boudots and other wines of Nuits-Saint-Georges – not all of them, by any means – Boudots has its full share of the rusticity, the solidness, the substantiality that for the experts seems to be the hallmark of this commune. But to that it adds an elegance, a polish, that lifts it above the rest. So for me, if Boudots is atypical of the wines of Nuits-Saint-Georges, it is atypically better and more elegant, and I love it. It is entirely possible that my experience of Nuits-Saint-Georges is not extensive enough to make this judgment, but I can only go by what I have tasted. If any good soul wants to set up an appellation-wide Nuits-Saint-Georges tasting for me, I will be happy to participate with open mind and open mouth. In the meanwhile, I intend to continue reveling in Burgundy’s recent succession of fine vintages by enjoying my Boudots whenever I can afford it. Despite being an active partisan of Italian wines, I retain a deep love of French wines, especially the great French red wines. In my youth, I thought Bordeaux was king – and besides, Burgundy was way more expensive then. But now, the situation has completely changed: Bordeaux prices have caught up with or surpassed those of Burgundy, while winemaking in Burgundy is reaching new heights. Moreover, climate change is helping Burgundy achieve more good vintages than ever before, and at the same time many Bordeaux reds are tasting increasingly industrial to me – and yes, I am talking about classified growths. So I have been turning more and more often to the great Burgundy villages when I want a change of taste from my frequent Italian tipples. Ergo, Chambolle Musigny. For me, the village of Chambolle is the sweet spot of the whole Côte d’Or. Opinions obviously differ about things like this, but for me Chambolle’s red wines have the greatest finesse, the loveliest, most complex fruit, the subtlest nuance of them all. Its two Grands Crus vineyards, Le Musigny and Bonnes Mares, are normally completely out of my price range, but the few times I’ve tasted either of them persist in my memory as moments of total palatal bliss – most notably, a lunch with the Drouhin family in Beaune a few years ago, at which they poured a 1968 Bonnes Mares. I don’t know which was my dominant feeling: honor at being so treated, or sheer ecstasy from the taste of that great wine. While I don’t have any Musigny or Bonnes Mares in my “cellar,” I do have a few bottles of Premier Cru Chambolle Musigny, and since Mortality has been looming over my friends lately, I sought consolation in a bottle just the other evening. I opened a 2004 Drouhin (regular readers will know my long-standing esteem for the house of Drouhin), decanted it and let it stand for about two hours before drinking it with a broiled top-quality strip steak. Bliss again, and a great respite from quotidian cares. The wine’s aroma was heady of bitter chocolate, tobacco, and dark, dry fruits. 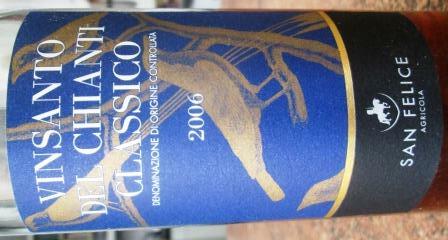 The palate was that and more, with mushroom and mineral notes interwoven with all that fruit and tobacco and chocolate. Diane and I sipped and savored and made that bottle last as long as we could, despite the temptation to just bathe in it. I know the village of Chambolle doesn’t loom as large in wine folklore as its neighbors, Vougeot and Morey Saint Denis, or the further distant Vosne Romanée or Corton. I guess that’s the only thing that has kept its prices from passing beyond all human reach. That narrow stretch of Burgundian hillsides that we call the Côte d’Or runs from a little south of Dijon to a little south of Santenay, a distance of only about 30 miles, regularly punctuated by different villages with at least slightly different terroirs. Chambolle lies in the middle of the northern half of the Côte de Nuits, which is the northern half of the Côte d’Or (the southern half is known as the Côte de Beaune). If you drive south from Dijon on Route Nationale 74, which runs the length of the Côte d’Or, you’ll pass many famous wine towns. Before you reach Chambolle are Marsannay, Fixin, Gevrey Chambertin, and Morey St. Denis. Just south of Chambolle lie Vougeot, Vôsne Romanee, and Nuits Saint Georges. This is obviously great wine country, and Chambolle Musigny’s sparse, pebbly, limestony soil is typical of the meager soils on which great wines grow. Plots are characteristically small – Le Musigny totals only a little over 10 hectares, and Bonnes Mares 15 – and are frequently divided among many owners, as is typical in Burgundy. Production is very limited, by law and by the quest for excellence as much as by nature: Hail is frequent here and can be very destructive – thus the always substantial price of good Chambolle Musigny. I can only say that the examples I’ve been fortunate enough to enjoy have been worth it. At its best the red wine can be quite simply the most delicious wine to be found in Burgundy. Speaking personally, and I am not the only one, it is the summit of achievement. With its vibrant colour, exquisitely harmonious, complex, profound bouquet, the blissful balance between tannin, acidity, and the most intensely flavoured fruit – all the petits fruits rouges you could reasonably imagine – and its incomparable breed, depth, originality and purity on the finish, a great Musigny is heaven in a glass. Would that one could afford to drink it more often. Now that’s enthusiasm! I’ll only add that the “lesser” wines of Chambolle Musigny are, in proportion, just as profound and moving. It’s a special occasion wine for sure, but one capable of making an occasion special. D-Day has saved me from many domestic embarrassments, because the day before it is Diane’s birthday and the day after it our anniversary, and because of it I’ve never been able to forget either. This year, even though none of that trio amounted to an intrinsically important number, we decided to make a big deal of our family occasions, with Diane cooking some special dishes and me digging out some special wines. And since we’d been lately on a pretty steady diet of Italian – indeed, mostly Tuscan – wines, I opted for something completely different, to switch countries and styles entirely: ergo, France, specifically Burgundy. You can read about the meals in Diane’s blog: I’ll just say we ate very well indeed, and probably a bit too copiously, but it was an unmitigated pleasure. I want to talk about the wines, which matched wonderfully with Diane’s dishes and were wonderful in their own right. This is what we drank. We drank this on both birthday and anniversary, as apéritif with some tiny gougère puffs. That may show a lack of imagination, but those airy little cheese clouds tasted marvelous with that big, full-bodied, austere and elegant Champagne, so – especially since we knew there was much more wine ahead and didn’t want to finish the whole bottle of Bolly the first night – we just reprised the combination 48 hours later on our anniversary. I assure you, nothing hurt. 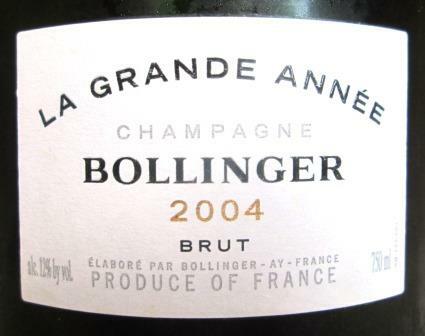 This was a great vintage, and a perfect example of Bollinger’s reliable linking of power and grace. This accompanied sea scallops nantaise, a surprisingly rich dish that needed to be partnered with a white wine of the authority of Clos des Mouches. 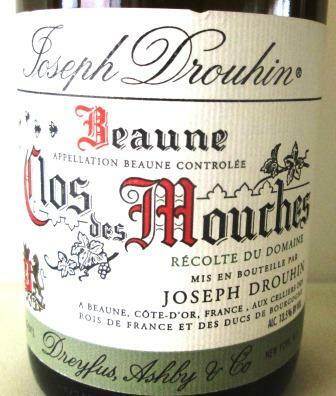 Drouhin’s Clos des Mouches has for decades been one of my favorite white Burgundies, and I think that even with all the respect it customarily receives, it is still underestimated. I would rank it right up in the top tier of white Burgundies, and this 12-year-old showed its breed beautifully with those succulent scallops. It was big, and smooth, and deep, round and complex, with layers of flavor showing themselves in successive waves of nuttiness and butteriness and dried pear. Once upon a time, I could afford to buy this wine by the case: Those days, alas, are long gone, but I have some glorious memories of them. We deliberately stopped ourselves from finishing the bottle, thinking ahead to the rest of this meal and to what Diane had planned for our anniversary dinner. Bouchard has a monopole of this vineyard, the red-wine twin of Drouhin’s white. 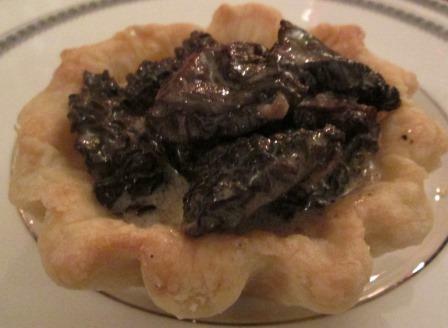 We matched it with a pheasant stewed with morels. This was just a glorious combination, cemented by the morels, which mediated between the earthy flavors of the wine and the near-gaminess of the pheasant. This is classic red Burgundy, just mature at 18 years, and showing all the complexity that Pinot noir at its best is capable of. This bottle we finished, with no trouble at all. As a small concession to Italy, and also because we didn’t want anything as sweet as Sauternes with the rustic apricot tart Diane had made for dessert, we finished with this lovely not-quite-sweet-not-fully-dry Vin Santo. Vin Santo may be an acquired taste, because it doesn’t fall neatly into the dessert-wine category, but it served ideally here as a refreshing yet far from simple conclusion to our dinner. For our anniversary dinner, we repeated the Bollinger and gougère puffs as apéritif, and drank again the Drouhin Clos des Mouches, this time with plates of Bosole oysters on the half shell. Once again, the match was perfect, the mature white Burgundy playing beautifully off the briny sweetness of those small oysters – two of my favorite things. With our entrée, a handsome rib of beef, we drank this lovely red. For me, Musigny is the sweet spot of the whole Côte d’Or, where Pinot noir shows its greatest elegance and nuance. These are rarely big wines, but they are always fascinating, and this one was no exception. We finished it with a little goat cheese and a bit of Brie, and we were very happy that we had long ago committed matrimony. Equally repulsed as Diane and I are by super-sentimental and hyper-commercial Christmases, we usually opt for a quiet dinner with a few close friends and a few choice wines, with a menu more or less traditional and background music eclectic. This year was typical in all respects, and especially pleasing to me because the match between wine and food worked out very well for each course. We strove for some elegance in the meal too. We began with Champagne, of course: It’s almost obligatory at this time of year, and Pol Roger never lets us down. That bubbly accompanied hors d’oeuvre of a mousseline of smoked sturgeon, a mousseline of asparagus, and almond-stuffed dates wrapped in bacon, the latter served hot out of the oven, all three playing nicely with the effervescence and acidity of the Champagne. At table, our first course was morilles à la crème en croûte. The morels were fresh, not dried. We had bought them during their brief season, sautéed them in butter, and, after eating as many as we could hold at the time, froze the rest for just such a festive occasion as this. They were delicious in their indescribably earthy, woodsy way. Swaddled in crème fraiche and cushioned on the world’s richest short pastry crust, they partnered beautifully with a medium-bodied, suave 2005 Aloxe Corton Premier Cru Les Vercots from Antonin Guyon. 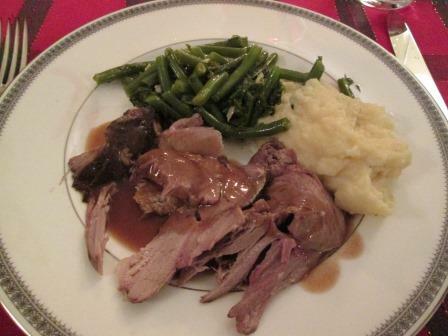 The pièce de résistance – this was definitely a French-accented dinner – was not a boar’s head (we’re not that traditional) but a long-cooked braised shoulder of wild boar, accompanied by French green beans and a puree of potato and celery root. Those in turn accompanied a very well-structured and deeply flavored 1998 Lafon Rochet in magnum. Maybe because it was in magnum, maybe because of the vintage, and certainly because of what the Tesseron family has been doing with this property for a few decades now, this wine could have easily been cellared for another decade. Lafon Rochet is a fourth growth St Estèphe estate that the Tesserons have transformed as thoroughly as they have their more famous Pauillac fifth growth, Pontet Canet. This Lafon drank most enjoyably, to be sure, but it still showed so much in reserve that it was almost a shame to have it now. But it was a fine wine with the boar. It had the strength and intensity to match the richness of the meat, and the polish and complexity to play intriguingly with the sauce. 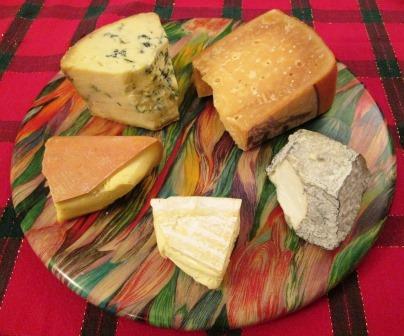 Then came the cheese course. and a great slab of Roomano (Holland), a sort of aged Gouda that simply loved the wine. The wine was my very final bottle of Auguste Clape’s 1988 Cornas, which I served with equal parts of hope and trepidation – the hope because some previous bottles of this wine had been glorious, the trepidation because the last one I had opened had been dead. Hope triumphed, I am happy to say: This was one of the glorious ones. In fact, it still showed some youth and vigor, and in addition its classic Cornas robustness made it a wonderful match for all the cheeses. I am deeply sorry now for all the bottles of this now-priced-out-of-my-league Rhône beauty that I drank before what-I-now-understand-to-be their peak. Of such simultaneous heights and depths is the wino’s life made. Michele Scicolone had brought dessert, so we next consumed (yes, we could still eat!) her luscious pine-nut-and-apricot-jam tart. I matched that with a 2001 Trimbach Riesling Vendange Tardive, a wine with some sweetness of its own but plenty of acidity and real heft. This was a shot in the dark, but it worked out well. The sweetness and savoriness of the tart meshed nicely with the lesser sweetness, acidity, and steely body of the Alsace wine. Of course, either would have been completely enjoyable on its own, but together they created one more dimension of pleasure and provided the final touch to what was for Diane and myself – and we certainly hope for our guests – a classic and only slightly Rabelaisian holiday feast. Rest in peace, Mr. Hall. By and large, Burgundy has been one of the beneficiaries of global warming. Over the past ten or twelve years, the region has enjoyed an extraordinary number of fine to superb harvests, often after idyllic summers. 2010, however, was far from idyllic, and vignerons had to fight hard to achieve the quality that Burgundy at its best is capable of. The very good news is that, by and large, they succeeded, and although the crop is small, the white Burgundies in particular from the best producers – of which Olivier Leflaive is emphatically one – are showing beautifully. I enjoyed the truth of that over a lunch with Patrick Leflaive and Jean Soubeyrand, president and director general, respectively, of the family firm. We tasted a half dozen of the 2010 whites, from Aligoté up to Grand Cru. At every level, the Leflaive wines displayed classic profiles, from color through aroma, palate, and finish. Needless to say, I was a very happy wine journalist. That high level of typicity was no easy accomplishment in 2010. The winter weather was pretty brutal: temperatures dropping below zero (Fahrenheit), severe frosts, snow and rain, with continuing low temperatures. March and April brought temperatures slightly higher than normal, but still abundant rain. May cooled down again and consequently slowed the growth of the vines, while June then ran warmer than normal. July and August returned to cool temperatures and more rain. Those low temperatures and all that rain caused flower failure and millerandage (small berries) throughout Burgundy. That in turn caused a small crop – but because September provided mild and dry weather, with good breezes to ventilate the vineyards and combat rot, the grapes ripened fully, with concentrated juices and good sugar levels and color. And the consequence of that is some splendid wines – smaller volume than usual, but of a quality to stand among the best. 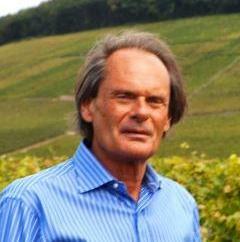 At Olivier Leflaive, winemaker Franck Grux has now 24 years of experience with Burgundian grapes and vineyards. He has been the chief winemaker for Leflaive since 1988, and he has developed an admirable ability to coax the Chardonnay from differing sites to express those differences clearly, along with the grape’s own character. Patrick Leflaive said that the firm tends to harvest its grapes a little early, especially the whites, according to Franck Grux’s and the family’s preference to make slightly lighter, racier, and more elegant wines. The Chassagne Montrachet 1er Cru Clos St. Marc certainly fit that description, from its brilliant aroma through to its finishing goût de terroir – a lovely wine, mouth-filling and at the same time light and agile, delicious with the very stylish version of clams casino I had alongside it. 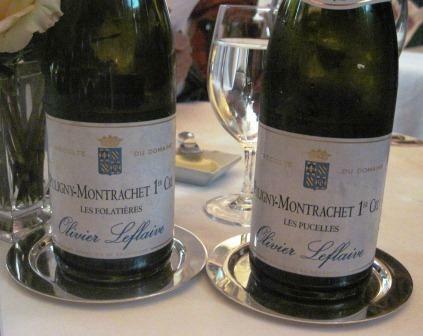 The Puligny Montrachet 1er Cru Les Folatières that followed the Clos St. Marc showed the marked differences between the Chassagne and Puligny appellations. The Puligny – both this one and the 1er Cru Les Pucelles that followed – had greater complexity and nuance than the comparatively straightforward and forthright Chassagne. Les Folatières was perfumed with honeysuckle in the nose and was richly floral in the mouth, showing a lovely balance (actually, that fine balance was a hallmark of all the wines). The Pucelles was much more mineral, yet equally poised and complex. Both wines possessed generous but unobtrusive acid, which made them wonderfully adaptable with food. Then we entered the stratosphere, both in quality and – alas – in price. 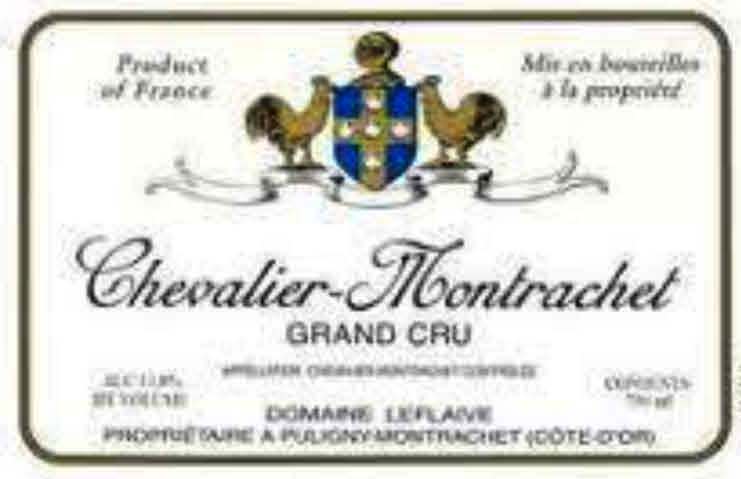 Grand Cru Bâtard Montrachet and Grand Cru Chevalier Montrachet stand among the greatest white wines in the world and have long been among my favorites (I can’t think of a better choice with Lobster Thermidor than Bâtard Montrachet). Once I could even afford them. That is no longer true, unfortunately, so the only chances I have to taste them are lunches like this one, for which I am profoundly grateful. Both these bottles proved to be very young: These are white wines that want time to compose themselves and show everything they have. If I had them, I would cellar them minimally for five years before I broached them, and with a vintage as distinctive as 2010 I would probably try to wait even longer. The aroma of the Bâtard was all flowers and mushrooms. The Chevalier was similar but even more intense. 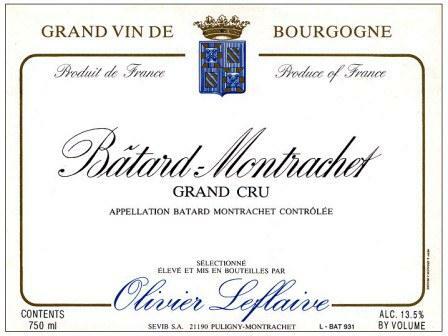 The palate of the Bâtard conformed closely to its aroma, with the earthy, fungous notes showing most clearly at this time, while underneath were all sorts of hints of flavors to come. This was a big, gorgeous wine that clearly needs time to develop. The Chevalier displayed brighter acidity, interspersed with the floral and fungous tastes it shared with the Bâtard. It too needs and will reward cellaring. Wines of this caliber and rarity can never be inexpensive. 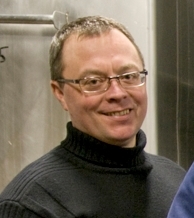 Olivier Leflaive owns all of 0.18 acres of Bâtard and a half-acre parcel of Chevalier, an ownership situation that is typical of the top-flight Burgundian vineyards. That does not produce a lot of wine, not even in the most abundant years, so a bottle of either is always going to be a special occasion, in and of itself. Life is short: Relish wines like this whenever you have the opportunity. 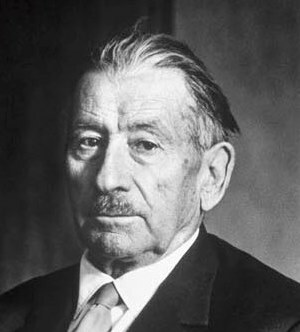 Olivier Leflaive wines are imported to the United States by Frederick Wildman. ‘Tis the season to be tasting! Wine importers are showing their latest arrivals, and there have been some splendid wines being splashed into glasses all over town. Several of these have been fine enough to make me deeply regret that the need for mere survival forces me to spit – but not to do so might be fun for a while and cirrhosis forever, so I have dutifully expectorated some good juice over the past few weeks. But enough repining: Here are some of the wines that impressed me most. You’ve probably heard a good deal of hype already about how fantastic a vintage 2010 is for white Burgundy. Well, my experience so far confirms that it isn’t just hype: this vintage is for real. Not across the board, of course, but over enough of the appellations (those I’ve so far been able to taste) to make it no more than honest description to say that 2010 is shaping up as one of the best vintages for Burgundy white wine for a long time. 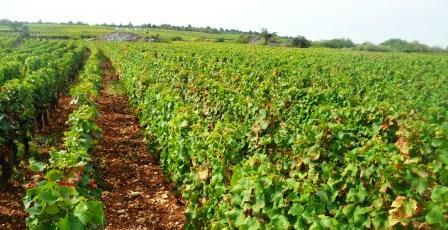 Burgundy as a wine zone has benefitted immensely over the past decade from climate change. Burgundian growers have been regularly achieving the kind of ripeness, and the attendant aromatics and flavors, that in the past were a once-in-ten-years occurrence, if that much. So 2010 really does deserve some bells and whistles. The northernmost of the Burgundian appellations, Chablis, qualifies as one of its brightest stars. I’m a pushover for honest Chablis, with little or no oak intervening between the grapes and my palate – so for me the whole line of Christian Moreau wines that I tasted at a recent Frederick Wildman event were pure enjoyment. Moreau vinifies all its Chablis in stainless steel and uses minimal oak – very little of it new oak – on its most precious crus. Its 2010 wines all showed classic Chablis flint-and-stones mingled with the most austere of Chardonnay scents. On the palate, the wines followed through in similar style, with varying degrees of intensity, from the very nice, basic AOC Chablis through the impressive Premier Cru Vaillon up to a battery of truly grand crus – Vaudésir, Blanchot, Valmur, Les Clos – culminating in the very rare, only-made-in-the-best-vintages Clos des Hospices dans Les Clos. All these grands crus, although drinking quite pleasurably already, belong to the class of Chablis that cry to be cellared: They are structured to mature and flesh out in what promises to be appropriately grand style. Were I a few years younger, I would try to put a case of these beauties away for a very long time. The three premiers crus I tasted – Meursault Poruzots, Chassagne-Montrachet Clos St.-Marc, and Puligny-Montrachet Champ Gain – were all splendid, with both the Poruzots and Champ Gain displaying their terroir with great distinctiveness and clarity. The Grand Cru Bâtard-Montrachet, although already a big and graceful wine, clearly needs time; in only a few years, it will be wonderful; in 20 years, probably off the charts. Bâtard-Montrachet has for decades now been my archetypal Lobster Thermidor wine, the older the better. Most of the red wines I’ve been tasting have been from older vintages than those whites, in some cases even re-releases of vintages that have been available for a while. Which is fine for the Brunellos and Barolos that impressed me at Winebow’s presentation: Additional age does them – and the consumer – a real favor. Both appellations benefit from, and in the best vintages demand, as much aging as you can be persuaded to give them. Fortunately for the producers of both, recent harvests seem to have set up an almost regular pattern of alternating, classic, highly structured vintages that require time to come round with softer, more accessible ones that can be enjoyed much younger – an ideal situation, in fact, for both the growers and the consumers: You get to drink your wine and have it too. 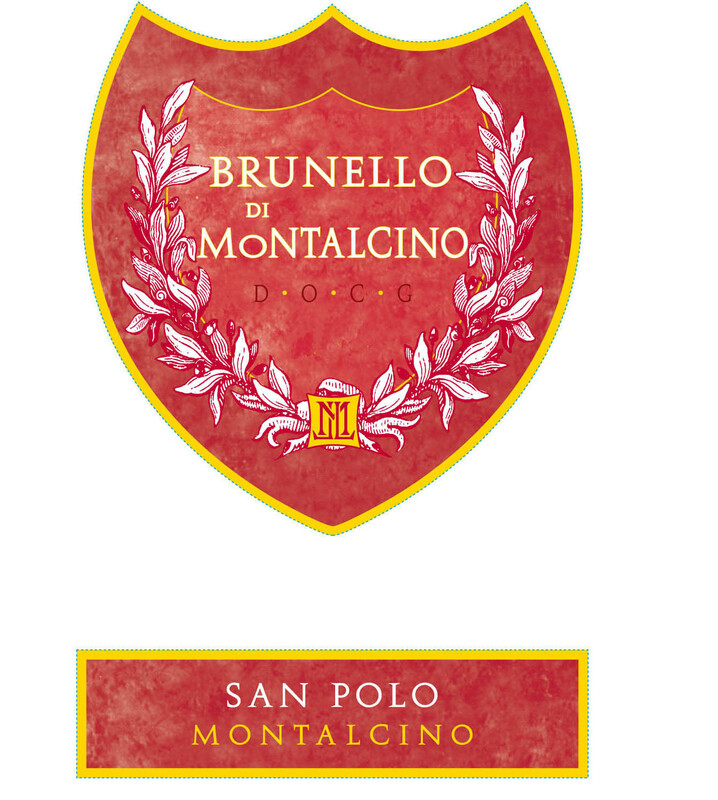 Among Brunellos, 2005 and 2007 are the more welcoming vintages, with many of Sangiovese’s youthful asperities covered by delightful, wild cherry fruit and an enlivening acidity: Salicutti provided excellent examples of both vintages. San Polo’s were equally good, but in a different style, showing more structure and less forwardness, but still with great fruit and balance and easy drinkability. Both houses made beautiful 2004s, with precisely calibrated combinations of fruit and earth tones and the kind of structures, with especially ripe tannins, that will keep these wines evolving beautifully for at least a decade yet. These are really classic Brunellos, the kind of wines the appellation’s high repute is based on. 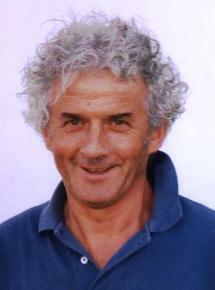 Last, but hardly least in my estimation, my great passion: Barolo, from one of the ablest producers, Roberto Voerzio. I still wish Voerzio would use a little less new oak than he does, but for the most part he handles it very well. Only occasionally does it intrude on the Nebbiolo flavors that constitute the whole point of Barolo, and then only to a degree that I believe will subside with time in the bottle. What comes through most in these wines is not wood but terroir. Voerzio has great vineyard sites – Brunate, Cerequio, La Serra, Rocche dell’ Annunziata – and he handles them very well indeed. I tasted the 2005 La Serra and Cerequio and the 2007 La Serra and Brunate: these all reflected the character of those two vintages in being remarkably welcoming for such young Barolos. This results not from cellar manipulation but from the character of the harvest, combined with all the changes in growing techniques that Piemonte has been adapting over the past 20 years. The ’06 Cerequio and Brunate were different in character. They are more classic style Barolos – generously structured wines that will take time to come round and then should last at an impressive level for decades. The 2006 and 2001 Rocche dell’Annunziata wines were flat-out gorgeous, the ’06 promising great longevity and the ’01 – with ’04 and ’06, a top-tier Barolo vintage – already showing the beginnings of the classic earth-and-mushrooms nose, even though it is a wine still evolving. Cellar this beauty by all means.